Ringu Tulku Rinpoche and all the people of Rigul wish to thank you, from the bottom of their hearts, for funding the school, the health clinic (including the new ambulance), poverty relief and basic sanitation in Rigul, Tibet, China. Rigul is Ringu Tulku’s main responsibility, he has his monastery there, is still the abbot and has to operate from a position in exile. IMPORTANT INFORMATION: In line with our commitment to best practice regarding data protection and in line with recent changes in UK charity law we urgently need your help. From May 2018 you will only receive further newsletters and other communications from us by email, telephone or post if you have opted in. (See below for further details). 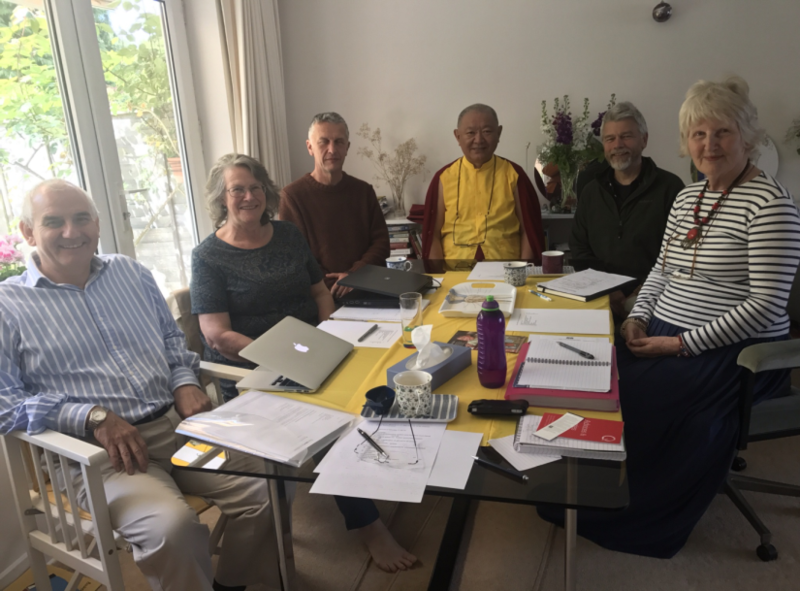 Meet the team of six: Left to right: Jeff Wilshaw, Treasurer: Sarah Delfont, Secretary: David Curtis, outgoing Treasurer: Ringu Tulku Rinpoche, Patron: Colin Moore, Chair and Webmaster: Margaret Richardson, Founder. Ringu Tulku is pivotal in all decisions regarding Rigul school, Rigul health clinic, basic sanitation and maintenance costs. All decisions of where the money goes and how much is given to Rigul projects is decided under the careful guidance of Ringu Tulku. 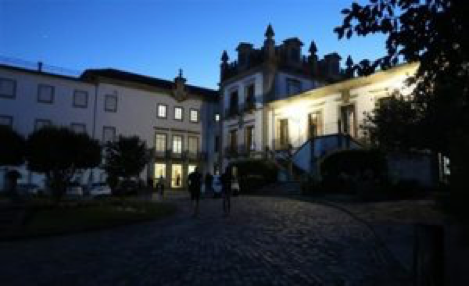 The trustees follow his guidelines closely and then make the final decisions in accordance with UK Charity Commission rules and regulations. My involvement with Rigul, Tibet, China started in 2003 when I found that Ani Choden, in Rigul, was running the health clinic with Dr Chuga and needed sponsoring. I helped sponsor her. From 2003 onwards, I have continuously helped raise awareness and funds for the school and clinic in Rigul for 15 years. Funds were sent to Rigul Foundation in Belgium between 2003 and 2007. Francois Henrard was very involved with Rigul Foundation and visiting Rigul. Before we registered as a UK charity, David and I raised awareness and funds around the Southampton area mostly. We registered in May 2008 and David and I became trustees. Once we had registered as Rigul Trust, it was then that I had a mission and a vision to get the Rigul Trust known internationally and this is a dream that has now come true. In 2015 I was officially promoted to Founder of Rigul Trust. Ringu Tulku set out a role as founder that included making sure the trust was going in the right direction, advising on fundraising, advising on new trustees, helping the trustees, and joining in meetings. I am in regular contact and work with Ringu Tulku, the trustees, the agent for Rigul and an intermediary in mainland China. My motivation and commitment for helping the people in Rigul are twofold. The first is that the people are extremely poor financially. They live in the remote Himalayas, winters are severe, there’s no heating in the homes only when cooking and we are the only avenue for routing funds for the school, the clinic, poverty relief and helping with the shedra. I have a keen interest in education and health having spent my working life as a registered nurse and a qualified teacher. The second motivation and commitment is as Rinpoche has his monastery in Tibet and is still the abbot in exile, I often think that Rigul is the centre of Bodhicharya International. The loss of their abbot in Rigul is our gain in the West and that’s why I am so inspired to honour Ringu Tulku for all his tireless help and boundless wisdom and compassion. So I rejoice in Ringu Tulku Rinpoche’s amazing teachings, travelling the world and his great spirit of generosity and kindness in showing us the way to lasting peace and happiness for ourselves and all beings. I joined the Rigul Trust in 2015 and eventually took on the role of chair. It has been wonderful to work with some very talented people in trying to fulfil the vision of the founders of Rigul Trust. Although I had worked a little with charities before, becoming a trustee felt a little daunting at first, but the Rigul team has been a great inspiration and it is a wonderful opportunity to be able to contribute to various projects in Ringu Tulku Rinpoche’s birthplace of Rigul in Tibet. It feels like a great way to say thank you for all the inspiring and accessible teachings he has given me over the years. I was asked to become a trustee at a time of transition when new structures and routines had begun to be put in place and with larger changes in UK charitable law looming. 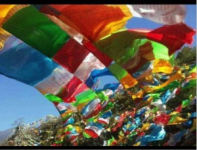 We now have a strong and harmonious team of trustees who work closely with Founder, Margaret Richardson and Patron, Ringu Tulku to fulfil both the charitable aims of the Rigul Trust and our obligations under UK charity law. Key to our success in the future will be to maintain a close relationship both with all our donors here in the UK, USA, Europe and elsewhere and also the people on the ground in Rigul who make your money go such a long way in often primitive and difficult circumstances. Our secretary, Sarah Delfont has more to say on this and I urge you to read what she says carefully and maintain your links with Rigul Trust through the necessary changes she is talking about. The benefit to those in Rigul is immense as is their need and the gratitude they feel towards their benefactors. I joined the Rigul Trust in December 2015 and took on the role of Secretary. It is a privilege to work with the Trust towards offering something to the people of Rigul as I have benefited so much from the teachings of Ringu Tulku Rinpoche. I work for a charity and I started a charity in 2003 so I have some relevant experience, though it is obviously very different working with the team in Tibet. The photos of the children and the people of Rigul also serve to remind me to appreciate all the things in my life I take for granted. 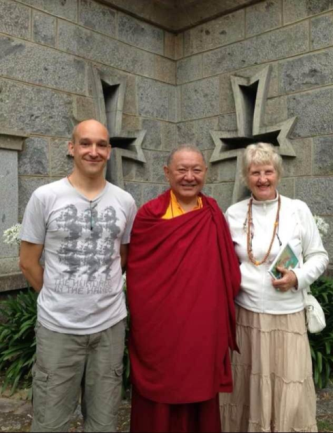 We have become a committed team of Trustees and with Rinpoche, Margaret and David, we benefit from the expertise and history of the Trust as we now look to the future. Rinpoche meets with us all each year to continue to support the work of the Trust and to give us guidance and advice. Margaret’s role as Founder is to support the Trustees in maintaining the ethos of the charity and to advise and be available for the Trustees to consult. The Trustees hold the ultimate legal responsibility for the charity and all decisions are made by them. In the last eighteen months, we have made the decision to focus on the ongoing support of the Clinic and School in Rigul, rather than diversifying and supporting other causes elsewhere. The costs have risen substantially since the charity started in 2008 and we now need £36000 GBP or 41000 euros or 48000 US dollars each year just for the running costs of the projects in Rigul. In western terms, this is not a large sum and without the support you all so generously offer, we would be unable to meet these rising costs each year. Michele Sisto has been a complete star in helping us develop our new database which needs some small refinements though, without Michele, I think I would still be staring at a blank screen wondering how to proceed. This will help us in ensuring we comply with the new Charity Commission requirements and, most importantly, keeping your records up to date and secure. In line with our commitment to best practice around data protection, we are moving to an ‘opt in only’ communications policy. This means you will only receive communications about our news, activities and fundraising appeals if you have specifically said you agree to this, and we will only contact you in the way(s) you have agreed to. When opting in you can choose how you want to be contacted – whether by post, email, phone, or a combination of all three. It’s entirely up to you. I will be sending out an email shortly with details of how to do this. When you receive it please reply with your preferences so we can make sure we are up to date. Your support is invaluable, without you none of our efforts would be possible. With the people of Rigul at our heart and with your support behind us, everything is possible. A small group of us in Southampton had been meeting every week to meditate together and to study Ringu Tulku’s ‘Mind Training’ book. We had the idea to cook a charity dinner party with the aim of raising £100 towards the cost of building a school in Rinpoche’s home village of Rigul. It seemed a natural gesture of gratitude and appreciation for the gifts of Rinpoche’s teachings, and an awareness that the place where he was born had been through so much hardship and difficulty since he and his family had been forced to flee the country. One successful fundraiser led to another. Margaret and I began collecting unwanted items and selling them at a local car boot sale to raise more. Word spread about what we were doing , and donations began to trickle in. Before long, the original aim of raising £100 had been met over and over again – we were raising £5000 a year, and it became clear that we should register as a UK charity. In my role as treasurer I have had the privilege of appreciating such great generosity being shown by so many people all round the world, many of whom will also have had their lives blessed by Ringu Tulku’s warm hearted teachings and example – and the privilege of working with a good team of people, helping a project of such simple goodness and value. I was invited to join the trust as a trustee last year, 2016, with the main aim of assisting with the treasury role. I come from a technical background having trained as a chartered engineer in the fields of civil & structural engineering. During my career I have worked for international engineering consultancies in the UK and overseas in Africa and India. In addition to my technical formation I have an MBA from Warwick Business School and currently run my own engineering consultancy practice. It is my hope that the problem solving skills from my engineering background in combination with my experience in managing projects and organisations will be able to benefit the operation of the trust. 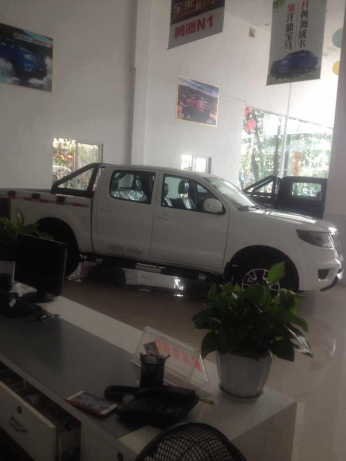 Ringu Tulku sent the photo of the brand new car/ambulance that Dr Chuga and team have bought. They are so pleased with the car. It will help a lot of people getting to hospital which is a day or two journey. The car can help Dr Chuga visit patients near and far, sometimes several hours drive and the car/ambulance is built for rough terrain in the mountains and for collecting medicinal herbs. The price they paid was finally 83039 Chinese yuans. Dr Chuga sends us a message that he is very happy and thankful for the ambulance. He has said thank you many times in different ways. Dr Chuga says that he will always do prayers for us. Dr Chuga with the car/ambulance. Thank you so much for all your help and generosity. The Gift of Group Altruism at Summer Camp. One evening at Bodhicharya summer camp, Andy Lowe so very kindly invited all of us to watch the film ‘Akong Rinpoche – A Remarkable Life‘. Akong Rinpoche died on October 8th 2013, and left a remarkable legacy behind him. He dedicated his life to helping wherever help was needed – often under extremely challenging situations, with kindness and care given equally to many thousands of Tibetans and westerners – he was a true spiritual friend to everyone who sought him out. He was both wise and pragmatic, equally at home whether sitting on a shrine room throne or on a building site breaking stones. After arriving in the west Akong co-founded Samye Ling in Scotland, from where he continued to expand his dharma activities across Europe, establishing many Samye Dzong centres as well as charitable organisations in the name of Tara. The escape from Tibet was gruelling, without food many times, having to eat the leather they carried. His journey out of Tibet would have been similar to that of Ringu Tulku Rinpoche’s escape from Tibet, over the Himalayas for nearly two years constantly under threat of gunfire from the Chinese occupying forces. They had to leave everything behind, possessions, home, friends, families, animals and country. 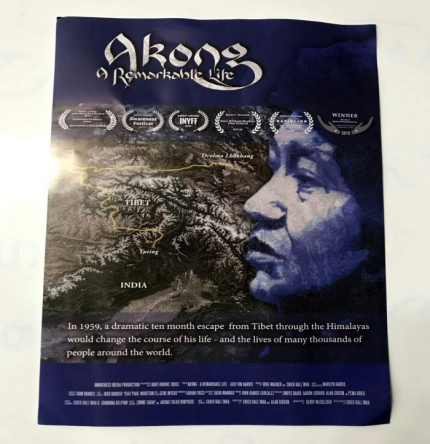 The incredible life of Akong Rinpoche has brought and still is bringing great inspiration to his students, friends and those who are hearing about his bodhisattva and altruistic life through this heart touching story. A life of service to others is one of the greatest practices we can offer and share in life. We are so interdependent, so privileged to have this precious human life and to have a purpose and direction through the dharma guided by our amazing spiritual friends. All of us who saw the film made an offering. 1.200 euros was raised. 600 euros will go to the Akong Memorial Foundation which is taking care of healthcare at the Dolma Lhakang Monastery in remote Tibet. 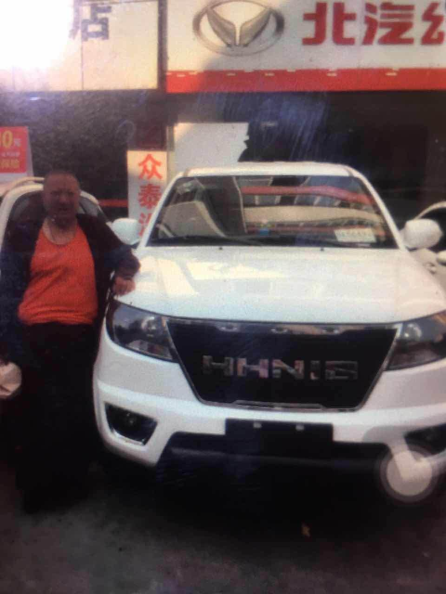 Rigul Trust will receive 600 euros which will go to Ringu Tulku Rinpoche’s monastery, school, health clinic and basic sanitation in Rigul, Kham Tibet where Ringu Tulku has his monastery and is the abbot in exile. Six of Ringu Tulku’s students in Kent did a sponsored climb to raise awareness and funds for Rigul Trust and Bodhicharya activities in Kent. 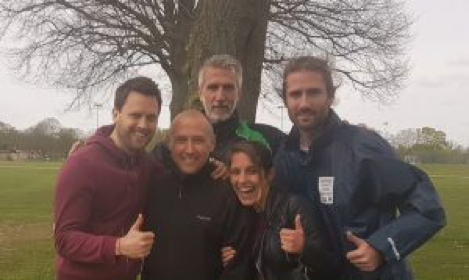 Cesare, Mick, Gary, Debra, Matthew and Samuel climbed the Three Highest Peaks in the UK in 72 hours. Gratitude for such warm hearted effort to help others. The great heroes of Rigul Trust are also the hidden names that contribute monthly by standing order, bank transfers, PayPal, one off donations and are beavering away in the background. Your names cannot be printed because of data protection, but the gratitude of Rinpoche and the people of Rigul, the Founder and the Trustees is immense. Thank you all so very much. Be happy, be joyful, go well, on behalf of the people of Rigul and the Rigul Trust team. No Comments to "Newsletter Winter 2017"